A good variety store email database has reliable and updated contacts you can use. When you buy our human-verified general merchandise mailing list, you'll get the sales leads you need to grow your customer base and make quality B2B contacts. To do business with variety stores, you need to know who to talk to. In the retail world, a good business contact list is one that allows you to get real results. Our general merchandise store email database helps you to avoid the gatekeepers and get right to the decision-makers. We make your marketing job easier by providing you with a variety stores mailing list that you can actually use, filled with real, direct contacts. 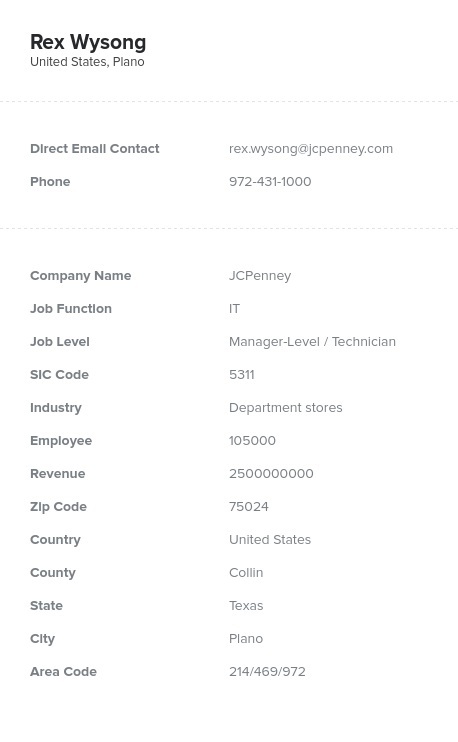 Buy this department store mailing list to get the names, phone numbers, and email addresses that you need. We'll also include each contact's job title, company information, mailing address, and even their fax number, if they have one. And we verify each department store email list to remove the mistakes that computers can make and deliver a variety stores email database that gives you the most bang for your marketing buck. Download this pre-built variety stores mailing list, or use our list-building tool to create a targeted and accurate general merchandise stores email list of your own based on your exact specifications, filtering sales leads by job title, location, and other factors. Either way, you'll get the data you need to seal the deal with retailers!